Assembling their Classical Notebooks. They would never admit it, but they were pumped! I was inspired by Half a Hundred Acre Wood’s post this summer describing the Classical Notebook her boys use in conjunction with the Classical Conversations Memory Work. I loved the idea of incorporating CC Review and Handwriting. (My boys can never get enough practice with handwriting! If I could foretell their professions based on their current handwriting, it’s DOCTOR all the way!) Also, I learned in college that through the discipline of transferring my notes from class onto flashcards, I would have most of the concepts immediately memorized. I later learned that this is characteristic of a visual learner. Since my oldest son is a visual learner just like his Momma, I knew that he would benefit tremendously from the discipline of writing out the Memory Work. I immediately decided that we were using a Classical Notebook this year for Cycle 2. This is how I assembled our Classical Notebook. I first bought a 2 Inch Binder and three sets of 8-Tab Plastic Dividers to have 1 divider for each of the 24 weeks per son. For each weekly tab, I included History Statement, English Grammar, and Science pages behind the 24 individual tabs. In the back of the folder, I included the Latin and Math resources that Half a Hundred Acre Wood included in her Classical Notebook post and printed maps for Geography from CC Connected. The Latin, Math and Geography I put into page protectors to use with dry erase markers since those particular pages will be used for multiple weeks. but it makes it easy for them to find by themselves. I decided to make my own documents for the English Grammar, History Statements, and Science Memory Work. I used the font, “KG Primary DotsLined,” which you can download for free here. The font made creating handwriting worksheets a cinch! Because these subjects contain Classical Conversations information that falls under copyright, I want to honor that and am making the files available on CC Connected At Home Sharing Center. You can find them uploaded by: suzannemosley. They are available as a free downloaded if you are a member of CC Connected. For the Timeline each week, I created a Timeline Copywork & Illustration Page. Each week my boys will pick one timeline card from that week’s seven cards. They will copy the title of the Timeline Card and then illustrate it. Hopefully, this will also reinforce the Drawing Grammar they’re learning the first 6 weeks of Fine Arts. You can download the copywork & illustration file here. This was our third week of school, but only our first week of CC. Thus, we have only been in our Classical Notebooks one week, but so far so good! When I told my oldest son today that it was Classical Notebook time, he said, “I thought the Classical Notebook was going to be really hard, but it’s easy.” I responded with a question, “And, it’s kinda fun, isn’t it?!? !” A huge grin spread over his face. That was all the assurance I needed that we’d struck gold with the Classical Notebooks! We are only one week in with our Classical Notebooks, but I am already marveling at what my sons are doing thanks to it! Their Timeline illustrations were beyond my expectations, and they were truly enjoying themselves! I can’t wait to see their joy when they realize that illustrating the History Statement is part of today’s task. The Classical Notebook has helped synthesize classical tools of learning, like copywork, CC Review, “independent” work, handwriting, and FUN into one component. Isn’t that amazing?!?! I also love that the Classical Notebook gives them something purposeful to do independently during our school day. This allows me to work individually instructing one son while the other is working solo on his Classical Notebook. 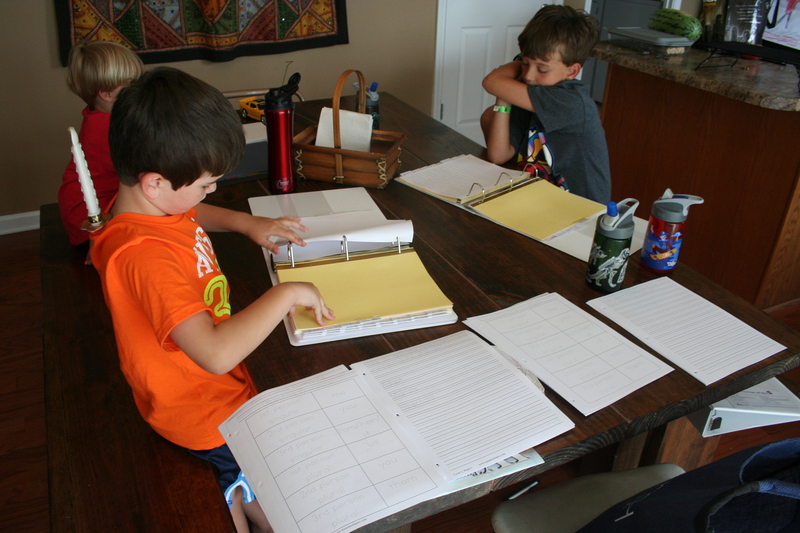 Then, we “flip flop,” and the other son comes to me for instruction while the other is Classical Notebooking it. 🙂 It also is liberating to me on some level. If we run out of time and can’t do our oral CC Review, I know they have been able to do some review on their own! So many good things in one 2-inch binder, right?!?!? I am excited that we are incorporating this into our school year! Any other Classical Notebookers out there? What do you love about your Classical Notebook? I came across your blog from another blog, thank you for sharing such great resources! Welcome, Kara! Thanks for stopping by and for commenting! I pray that you have a great CC year!!! wow! praying that you have a great year as you venture to tutor both foundations and essentials this year. you’re my hero!!! 🙂 glad to know the copywork pages are helpful! have a great year, Amy! God bless!!! This is a great idea!! I am in my first year of CC, and I am also the Abecedarian tutor for our group. I am hungry for all the ideas I can find for my daughter and to share with others, and this sounds like something that will work for us! Thank you! These are fantastic! I was easily able to download fom the CC share site and look forward to using them this week! I work part time, homeschool full time, and have two foster kiddos so any resources like these are super helpful as I simply do not have time to put them together myself! You are amazing! awesome!!! so glad that you easily found them on CC Connected! I hope that they will be helpful this year! 🙂 Praying that you have a wonderful CC year!!! are they still on there? I searched your name and it says no files found?? yes, they are! 🙂 i just checked. Make sure that you’re searching by my name “suzannemosley” rather than the name of my blog. Hi Suzanne! I found your blog by a share that our CC Director did through email. Love it!!! One question: what is the recommended age to begin with this notebooks? My daughter will be 6 in August and still working on get handwriting. Hi Suzanne!! Our CC Director shared your blog through an email and I love it! Subscribed to it and follow through FB as well! One question: At what age would it be appropriate to begin note booking? My daughter will be 6 on August and we are still working on her handwriting (a little bit of a reluctant writer). Thanks for any advise! My 6 year old son had a Classical notebook this year. He simply traced over the New Grammar assignment for the day (we did 2 subjects per day). I intended to have him re-copy each piece of information after tracing, but I realized that was too difficult for him. I didn’t push it….because he’s six. 🙂 However, he seemed to enjoy doing it each day….particularly the days for History Sentence and Timeline because he got to illustrate the sentence or a timeline card of his choice those days. So, I would just take a gentle approach and monitor how she’s doing. You know her best! 🙂 I loved that it was an activity that he could do independently and that it helped him build stamina and lengthen his ability to sit still and focus.